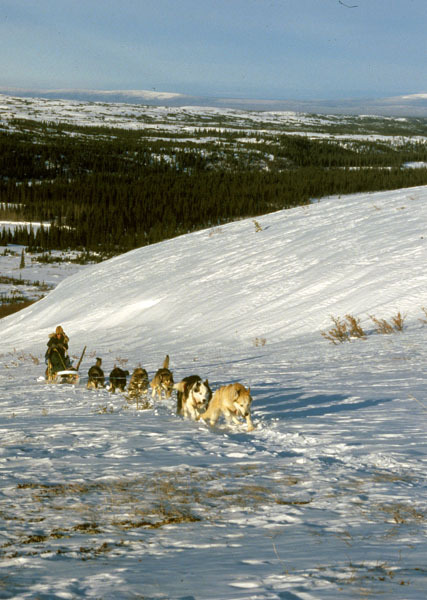 My introduction to dog sledding was a commercial tour ride near Winter Park, Colorado. What a fantastic way to see the country! The sun was shining, the air was crisp, and the only sound was the slushing of the runners and the breathing of the dogs. We sped along into the high country, me tucked into a warm sled bag, the driver riding the runners, and the dog’s running joyfully down a hard packed trail. I was hooked! It’s fun to join friends for a day of dog sledding through the winter countryside. If you have your own team of dogs, are somewhat proficient in dog sledding, and have some basic winter survival training, the possibilities are endless. Plan a winter camping trip and load up the dogs. Include a little ice fishing or just relax and get away from it all. Get together with a few other drivers and their families and explore some new trails. Many parks allow dog teams if you obtain advance permission. There are 150 mils of groomed snowmobile trails at Red Feather Lakes alone in northern Colorado—perfect for running sled dogs. If you like to cross country ski, just think how much fun it would be to have your dog pull you effortlessly along with a tow rope. I’ve been on some wonderful old logging roads there that would be perfect for ski jouring. Or you can get involved in racing, from sprint to long distance races with anywhere from one to a dozen or more dogs. Local races are a family sport, with events for all ages, and it’s great fun to gather together with other enthusiasts to test your skills, your team’s speed and endurance, and enjoy a weekend of fun and fellowship. Winter isn’t the only time to enjoy your sled dogs—in the summer they can pull a three-wheeled cart, or jog with you. 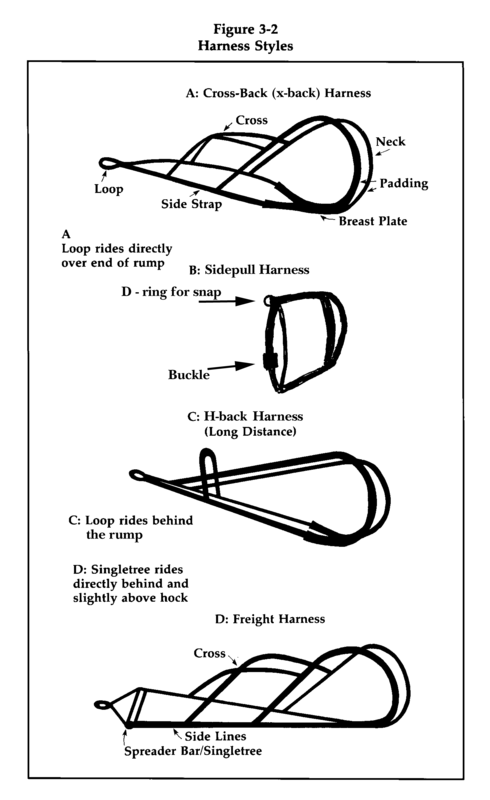 There are several types of harnesses for different applications. have the right equipment with the right fit. You will need to learn about harnesses and harness fit, ganglines, sleds, and how to hitch up a team. You can train your own dog, or you may want to start with at least one trained lead dog. The Lead dog’s main function is to hold out the gangline and take the team down the trail. Lead dogs have to have a special desire to please, take commands, and command the respect of the rest of the team. He should not be scrappy or aggressive, and he must want to lead. A leader that has been trained to take commands will command a good price. Or, you can train your own, but it will take some time and experience to develop a trustworthy lead dog. Saftey is important. When Noel Flanders wrote The Joy of Running Sled Dogs, she told me of a time when her team ran away and slammed her sled into a tree so hard she suffered broken bones. Miki and Julie Collins relate experiences with angry moose, broken runners, and sleds tumbling off the trail. So, it’s important to know how to stop and turn your sled. Run with others as much as possible, especially while you and the dogs are learning, know how to make minor repairs and always let someone know which trail you are taking and when you expect to return. 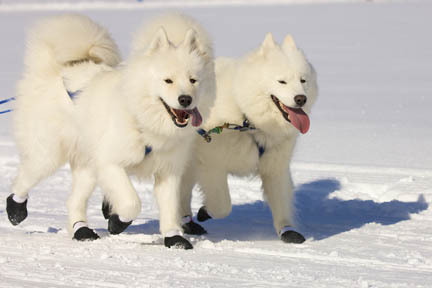 A team of Samoyed dogs wearing booties. One little trick that you will need to know about if you have never owned or driven a sled dog is how to select and fit booties, how to make them, and how to keep them on! Booties are just about essential for a working sled dog, and keeping a dog’s feet sound and healthy almost approaches an art. With just a few tips and some lessons, though, you can get started learning this invigorating winter sport, and especially if you own dogs of one of the Northern breeds, or a cross, your dogs are sure to love this sport! You can learn more with my favorite dog sled training book by Miki and Julie Collins, who have driven sleds for a living as well as for fun, for more than a quarter century. Dog Driver, published by Alpine Publications, will give you all the information you need to get started right whether you envision a team for recreation, work, or racing. The Collins sisters travel many miles across Alaska each year. 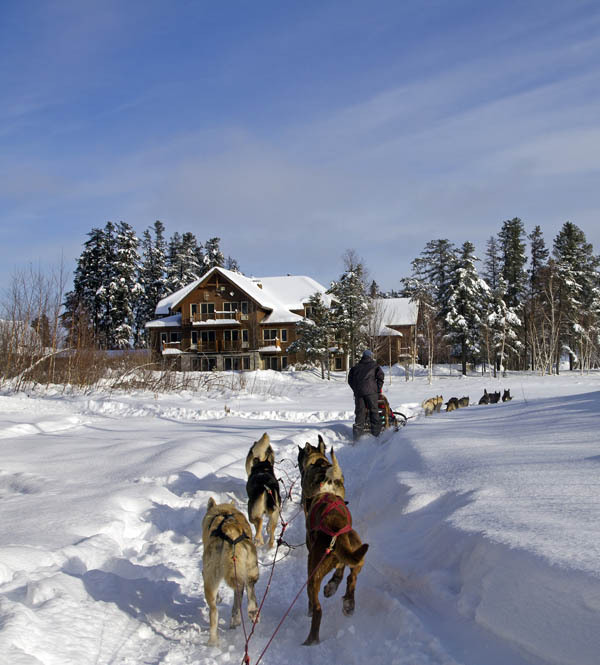 This entry was posted in sled dogs and tagged dog booties, dog driving, dog sledding, dog sledding equipment, dog sledding for fun, dog sleds, recreational sled dogs, running sled dogs, safety with sled dogs, sled dog driving, sled dog equipment, sled dog harnesses, sled dogs, types of sled dog harness. Bookmark the permalink. « Newfoundland Dog Facts – The Versatility of the Gentle Giants will Amaze You!